La Brisa Loca is situated in an over 100-year-old, new-republican mansion that has been restored to highlight its classic colonial, Caribbean charm. While bringing comfort and convenience to your stay, we also impart history and style. The large, high-ceiling manor, with its eighteen dorms and suites houses up to 90 people. Taking in the traditional style and color schemes of authentic Colombian Caribbean architecture, you will enjoy and appreciate the highlights of the region, not only out and about in the oldest colonial city in the Americas, but also comfortably in your hospedaje. At La Brisa Loca you can explore and discover Colombia in comfort and style…but then you must face the greatest task of all…leaving the hostel! Rum Junkies is our full service bar that also offers an extensive breakfast and lunch menu. Our guests enjoy the bar’s unprecedented 5 hours of ‘happy hour’ daily, regular themed parties and broadcasting of major sporting events. We also have Monday Burger night, Thursday quiz night, Saturday pool BBQ, language exchange, Full Moon rooftop parties and don’t forget the wheel of debauchery! 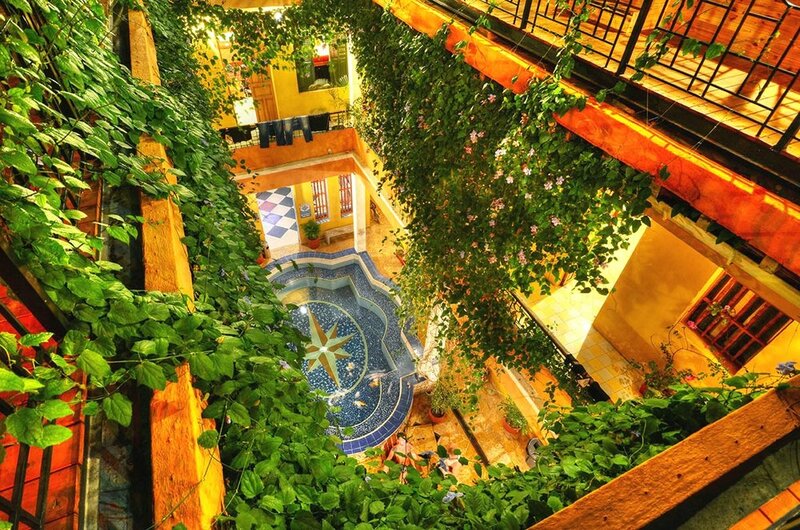 Don’t be fooled by the luxurious architecture, beautiful décor, or exceptional amenities…La Brisa Loca is a social hostel where you will meet interesting people from around the globe. As our name implies, we pride ourselves on helping our guests get a little ‘loca’ while in Santa Marta, whether it be through rallying troops in our bar or encouraging you to venture out and explore the region and get into some adventures! "With space for almost 100 backpackers throughout the plush complex, the fiestas at La Brisa Loca are undeniably loca (crazy)." "This vast, 82-bed capacity hostel has everything its young, festive crowd needs."